On September 26, 2016, at the Ignite conference in Atlanta, Microsoft launched the newest release of the server operating system - Windows Server 2016. It is a cloud-ready OS that can be used to run traditional applications and datacenter infrastructure, and at the same time, delivers innovation to help customers transition workloads, to a more secure, efficient and agile cloud model. Azure Site Recovery is at the intersection of this OS, combined with improved features for your disaster recovery needs. We are excited to announce Azure Site Recovery’s support for Windows Server 2016. Customers can now use Azure Site Recovery to replicate, protect (or migrate) their Hyper-V virtual machines hosted on a Windows Server 2016 to Azure or to a secondary site. 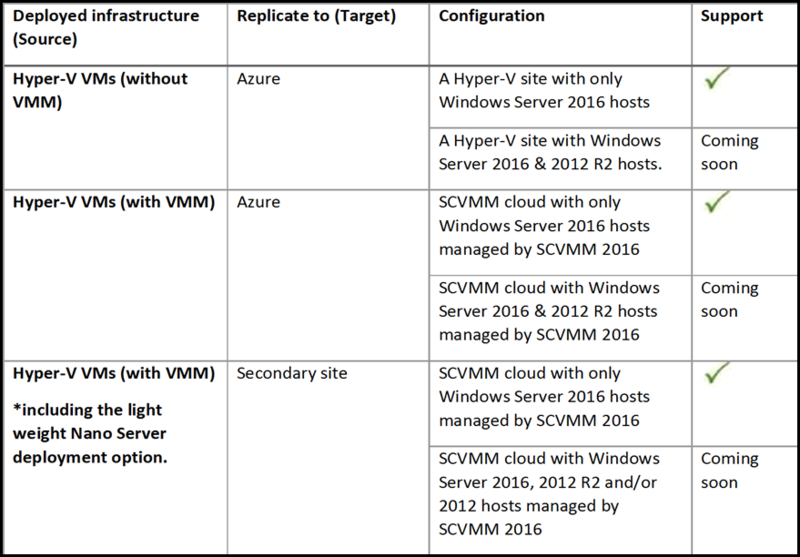 This week, we are announcing Azure Site Recovery’s support for protection & replication of virtual machines deployed on a Hyper-V Server 2016 in the following configuration. We will continue our journey to enhance our support for this Cloud OS platform, in the coming months. Update: We support the following configurations deployed on Windows Server Core 2016 along with deployments on Hyper-V host clusters with the latest provider and agent. Support for recovery to an alternate location will be released soon. A guided Getting Started experience which removes the complexity of setting up DR and makes it easier to protect and replicate your workloads. Recovery Plans and Azure Automation to enable a one-click orchestration of your DR plans. Ability to perform DR drills (test failovers) to confirm readiness, which guarantees zero data loss. Replicate your data once, and use it to perform disaster recovery, migrate workloads, or create DevTest environments in Azure. Coexistence of classic & ARM deployment models: Azure originally provided only the classic deployment model. With the ARM based deployment model, you can deploy, manage, and monitor all the services for your solution as a group, rather than handling these services individually. You can choose either of these deployment models for your fail-over VMs in Azure Site recovery. Organizations can now use Windows Server 2016 combined with the enhanced capabilities of Azure Site Recovery to tackle operational and security challenges, achieve cloud-integrated disaster recovery or cloud migration. We envision, that this will assist in optimizing your IT resources to strategize and innovate solutions which will help in driving business success. You can check out additional product information, and start replicating your workloads to Microsoft Azure using Azure Site Recovery. You can use the powerful replication capabilities of Site Recovery for 31 days at no charge for every new physical server or virtual machine that you replicate. Visit the Azure Site Recovery forum on MSDN for additional information and to engage with other customers, or use the ASR UserVoice to let us know what features you want.